Scientists are developing ground-breaking technology which could assist British growers with the challenges they face in harvesting crops. Increasing demand for home grown produce, coupled with concern about workforce shortages in the wake of Brexit, are leaving farmers across the UK facing a unique set of pressures. Farmers have experienced losses and were left with food rotting in fields after more than 4,300 vacancies went unfilled last year on fruit and vegetable farms, according to new data. To try and overcome this, researchers from the University of Plymouth are working with producers in Cornwall to create robots which can work alongside existing workforces and ensure any gaps in productivity are filled. 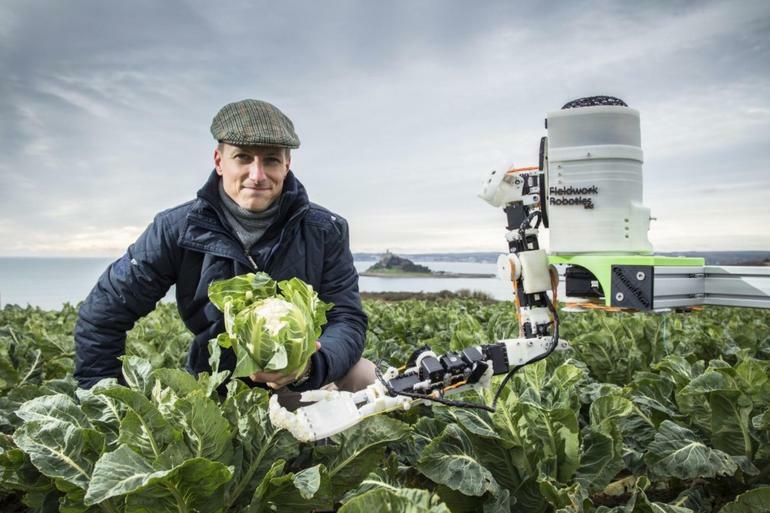 The Automated Brassica harvesting in Cornwall (ABC) project is being led by Lecturer in Robotics Dr Martin Stoelen, with key agricultural expertise provided by Professor of Plant Physiology Mick Fuller. It also involves strategic partner Teagle Machinery Ltd in Truro, and partners Riviera Produce in Hayle and CNC Design Ltd in St Columb Major. It has secured funding from Agri-Tech Cornwall, a three-year, £10million initiative part-funded by the European Regional Development Fund, with match-funding from Cornwall Council. Dr Stoelen has previously developed technology that can harvest tomatoes, raspberries and sugar snap peas, and is now refocusing that to assist with the picking of cauliflower, broccoli, kale and cabbage, which are extensively grown in Cornwall. Dr Martin Stoelen said the project would like to prove that robotic technology can work in rural environments, and it is affordable, viable and can help increase productivity on farms. “Manual harvesting represents a large portion of producers’ total costs, often it can be up to 50 per cent, so looking at addressing that – especially against a backdrop of Brexit – is very important,” Dr Stoelen said. At the heart of his vision is the concept of ‘variable stiffness’ because while most robot arms are rigid, the ability to flex and bend is vital in a more variable environment. To counter that, Dr Stoelen will build on one of his previous projects – the GummiArm – which has two arms and, in many ways, it moves more like a human than a machine. Another of the challenges is how to enable the robot to identify the cauliflowers that are ready for harvest and to distinguish the precise part to be taken. The solution to that is likely to come through cameras and sensors in its 'hands' that can make real-time 3D models of the crop by assessing the information it assimilates, allowing it to recognise what to collect and what to leave. With such robots recording images and touch-data from all over a field in real time, they also bring the possibility of gathering information that could be a variety of ways, potentially extending their application to beyond harvest. Dr Stoelen also believes the machines could be repurposed during the growing season, allowing the core technology to be rolled out to other fieldwork operations, and it could also be relevant to other brassicas and crops.